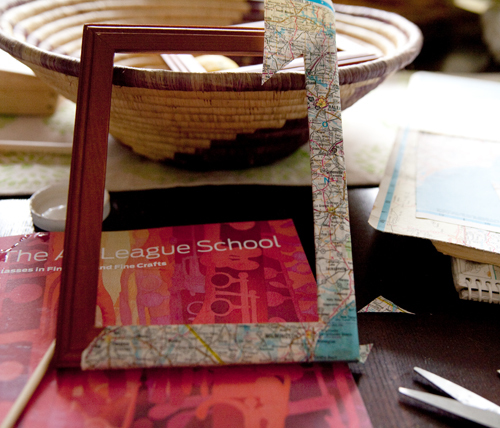 Among my “upcycle” supplies, I’ve hung onto various maps and atlases Katie and I picked up on freecycle when we made this woven basket from folded maps. 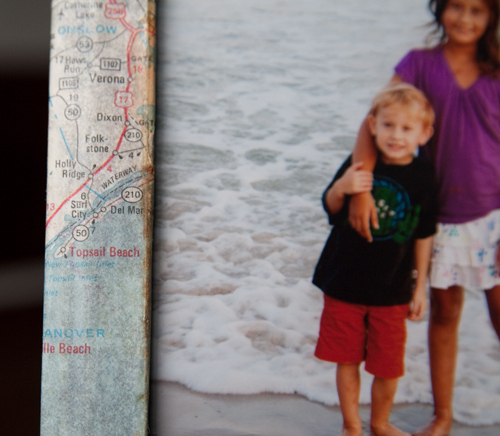 I’m glad I still had a few to make a decoupage frame highlighting the North Carolina beach we’ve visited for many years. I started with a couple of cheap frames from A.C. Moore ($3 each). Luckily, I found many maps showing the same coastline. I figured out where best to position the location on the frame and then cut out the image leaving about an inch margin all around. Then, I used a small paint brush to apply mod podge to the frame and underside of the map. I folded the edges around the sides and smoothed them down as I went. I also cut the paper at an angle in the corners so the corner folds would look nice and neat. I put sections featuring the region all around the perimeter of the frame. 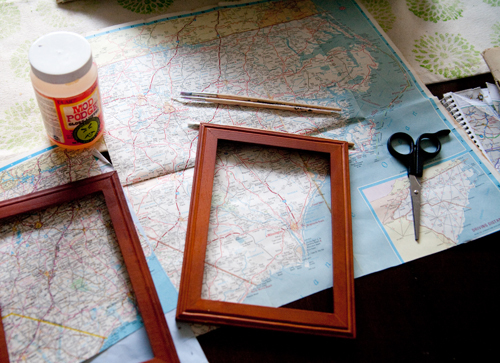 After applying mod podge liberally over the entire frame, the vintage maps took on a nice patina and added some nostalgia. I’m sending the frame as a thank you gift to my friend’s Sara’s parents who own the house and live year-round in the Midwest. The children in the photo are their two grandchildren, Liam and Belle. I even found a few more maps showing the same coastline and towns, so I can make another map frame for Sara. 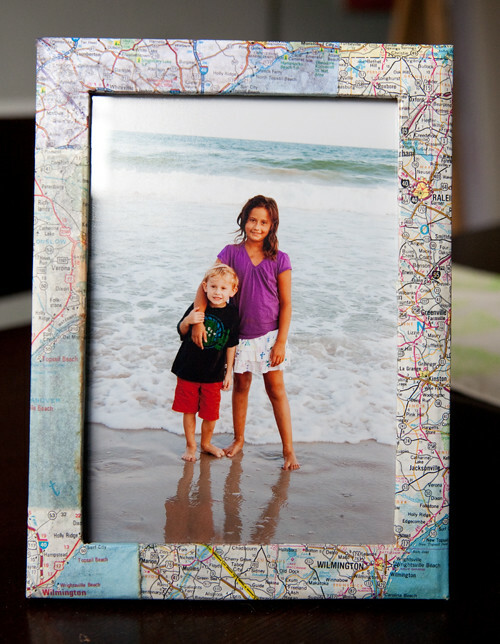 This project might also work well for couples so show where they met, wed, honeymooned, that kind of thing. 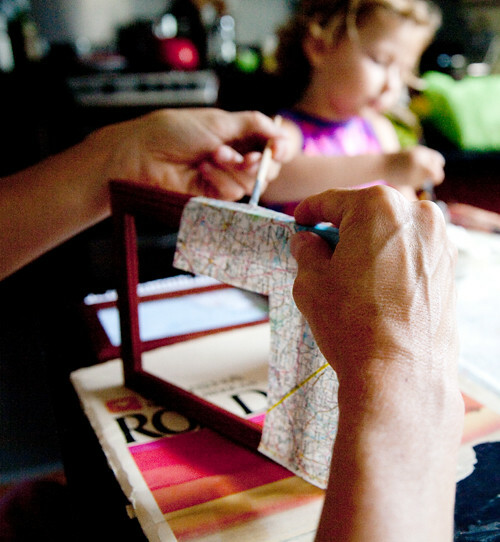 It’s a fun, easy craft that commemorates in a lovely way the places we hold dear. Came over from RoadKill Rescues – what a great idea. TYFS.